After warming up to my canister stove and getting the hang of it I started looking into some alcohol stoves. I made a few Pepsi can stoves and to my surprise they were actually fairly efficient. I made one of the Supercat stoves and it was way too much flame for me. (I never felt that I did well with the Supercat so I would like to toy around with it again one day.) I also made some of the aluminum Bud Light bottle stoves. I made 2 of them, each with a different take on the jets. I eventually ended up getting a smaller Ti pot and decided to get an alcohol stove to go with it. I figured I would purchase one since they were fairly cheap and much better quality than what I was producing. They are fun to make and all but I figured I would go with the White Box SOLO Stove. I chose the SOLO stove over the Original White Box Stove because the SOLO was a smaller stove that was meant to be used with smaller pots. I found out over time that the SOLO was best used with stoves with at least a 4″ diameter. The SOLO is smaller than the Original in that it is not as tall, it holds less fuel, and there are fewer jets. Long story short, I did not read about the SOLO in its entirety and the stove ended up not working with my pot since it’s diameter was 3 5/8″ which was way too narrow for the SOLO stove to work efficiently with. Bill from White Box Stoves was very kind and ended up sending me the Original since the SOLO was too small to work with my larger 1.8L cook pot and too big for my 700 ML Ti pot. He explained the stoves to me in more detail even though I did not do so before hand. So, now I am looking to get a GSI Ultralight Tea Kettle to use with the White Box SOLO Stove. As far as the stoves, they are beautiful little stoves. They look oh so sweet with the flames shooting out. The rolled top is crafted flawlessly. The stoves are pretty tough considering they are just aluminum bottles due to the rolled tops. They are very sturdy when using them with any of my cook pots. Once I use them a little more I will write a more detailed report on them and be sure to post it on here. Hey bud, glad you are on here! Thanks for commenting, and I love you! I got the white box stove in the mail today along with my GSI Minimalist…..and it is not going to work out. I cannot even get the pot on the stove because the flames engulf the little pot. It might be alright if there was a handle on the pot, but it only comes with a little hand grip you put on and take off your fingers to grab it. Would the GWP work better for this smaller size pot? or should I just keep the white box and return the minimalist for the soloist. The main reason why I got the Minimalist is because I can use it as a cup too…otherwise I would have purchased the tea kettle or their soloist. I too have a WBS Solo and have found that it has a large flame pattern which makes it less than ideal for narrow diameter pots. In my opinion, the Original is the way to go with the WBS. My Original actually weighs 0.1 oz less than my Solo, but it has a larger fuel capacity and a slightly larger flame pattern. I have found that the Original works like a charm with my GSI Kettle, really, this has been my kitchen set-up for a while and I have been pleased with it. I will say though that once the pot is positioned on top of the stove for a few seconds, the flames will die down a little. I use a Backcountry.com 700 ml Ti cook pot with my GWP and while I just don’t use this set-up that much, I am happy with the way that the GWP works with the narrow diameter BC cook pot. My BC pot is actually a little narrower than the GSI Minimalist, so I feel like the GWP would also work well with the Minimalist. Although, if you wanted to try some other options, you could look at building some open flame chimney stoves (check out Zen Stoves for all the details). Other options are the Venom stove by Zelph (http://www.woodgaz-stove.com/) or the mini atomic by Tinny (http://www.minibulldesign.com/apps/webstore/products/show/1512931). I cannot personally vouch for either of these stoves, but at the cost, I will end up with both of them eventually…however, they will work well with these small diameter cook pots. As for what to use for 2 person, I guess it depends on what you plan to cook. If you are simply boiling water, I highly suggest the GSI Kettle. Like I said, it works sweet with the WBS and it has right at 1L capacity, so enough to boil water to cook with and have a little left over for hot drinks. However, at times, I have had to boil a second time for more water. If you plan on cooking the GSI Dualist will work great for that too. Another option that I would suggest is the 1.3 L Evernew cook pots. I just got the 0.9L Evernew Ti pot and it works very nicely with my WBS as well. If it were me, I would keep what you have and find a stove that works for your Minimalist. One thing you can try is too buy a can of Fancy Feast cat food, feed a cat and then simply use the can as an open burner. You will need to use a pot stand with it though because this type of stove is not meant to have the cook pot sitting directly on top of it. Just set up a pot stand around the stove, add some fuel and light it. just be sure to add a windscreen! This is the type of stove that I am using with my Heine cook pot. Works well and was quite inexpensive. Would the white box stove be a good stove to take on overnight trips to weekend trips, or would you suggest taking a something like the Optimus Crux, MSR Pocket Rocket,or Jetboil Zip for short trips on the trail? For a short trip, the real benefits with alcohol stoves are weight savings. Of course though, how much weight savings depends on the set-ups you use versus the set-ups you would have used. For instance. I can take my Heine set-up (2.8 oz) and 8 oz of fuel out for 3 days and still come back with a little fuel, but for a grand total of 10.8 oz. Not to mention, each day as I used my fuel, the weight would drop. I typically use 1 oz of fuel per meal, so 2 oz per day, 1for breakfast and 1 for dinner. So, each day my weight would drop by 2 oz. At the end of the third day, I should only have approximately 2 oz of fuel left, plus my 2.8 oz for the Heine set-up so I come back with 4.8 oz. I just sold my Optimus Crux stove, but if I were to carry it (3.3 oz) and a 4 oz fuel canister (~ 8 oz – remember the weight of the canister too, not just the fuel) and even my light-weight Backcountry 700 ml Ti pot set-up (4.3 oz) I start off with a total of 15.6 oz. I cannot remember the amount of fuel used for each boil, but it was somewhere around .4 oz. However, I will just say it is 0.5 oz per boil (and I really don’t think it was close to that). So, after 2 boils per day for 3 days, that is 3 oz loss. So, the weight would go from 15.6 to 12.6 oz, which is still more than I started with on the alky set-up! 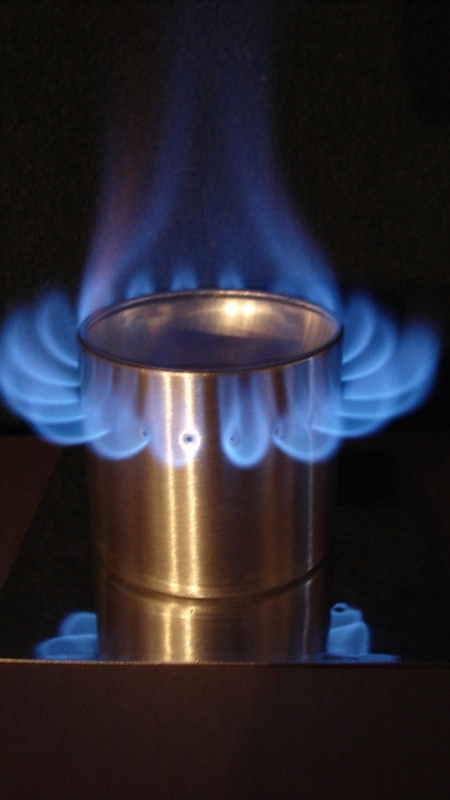 However, over longer periods of time, a canister stove will equal out to less weight. As far as volume, canister stoves are more efficient than alcohol stoves. However, IME, alcohol stoves are just so much fun I enjoy using them. So, that is a personal thing I guess. Also, keep in mind that an alcohol stove will generally take at least 5 minutes to bring 2 cups of water to a boil, depending on particular set-up and surrounding conditions it could take almost 10 minutes. Hope this helps, and thanks for stopping by and leaving a comment! What’s the difference between the WBS and the GWP? WBS stove holds 1.5oz of fuel & the GWP hold 1oz of fuel correct? They look quite alot alike. The Original White Box Stove will hold 3 oz of fuel and the SOLO version holds 1.5. If you are planning to use it with your new Tea Kettle I would suggest going with the Original rather than the SOLO. They both weigh the same and are both created equally. The SOLO has a slightly smaller fire ring once fully bloomed so it is aimed at smaller diameter pots. I actually do not use my SOLO but always carry my Original whenever I carry my Tea Kettle. It is quite the pair! The Gram Weenie Pro is essentially a smaller WBS in all matters. It is physically smaller as well as has a much smaller fire ring. My 700 ml Backcountry.com Ti pot has such a small diameter (3 5/8″) the WBS SOLO’s fire ring was still a little too large for it, so I went with the GWP. (The flames actually lapped up around the edges of the cook pot resulting in big time heat loss.) The GWP will hold 1 oz of fuel and will bring 2 cups to a boil. It also sports the rolled top which makes the whole stove super strong! Be sure to match your stoves fire ring to your pot that you are planning to use with it. I found out the hard way that not all stoves work with all pots. If you have any questions you can contact either of the guys that sell the WBS or the GWP and ask them and they will be very happy to assist. I would suggest though to have measurements of your cook pot/kettle available before you contact them though so the process will go a little smoother. Anyway, thanks for checking out my site and thanks for the questions. If there is anything else just ask!